We are now washing and drying clothes in our unfinished house. Of the appliances that came with the house; dishwasher, stove top, and built in oven, the washer and dryer are the only items that we didn’t donate to Habitat for Humanity. (We also kept the gas water heater thinking we will eventually use it for hot water storage.) We stored these appliances first in the garage and then in the garden shed. I was getting tired of taking our laundry out of the house to wash, even though the kids never seemed to mind. Since we are in remodeling mode for the long term, I decided to bring them inside and find out if they worked or not. Eventually we will replace them with Energy Star models but for now it is great to have this convenience again. I had already hooked up a kitchen sink near the utility area and had to work around that and the existing gas pipes that will need to be moved, so the placement is not ideal but it will work for now. I connected a washer kit to one of the water loop supplies and the drain kit to the stand pipe in the utility area. Then I reconnected the gas and flue to the dryer. To connect the washer supply kit I used the pex cinch clamps instead of sharkbites. 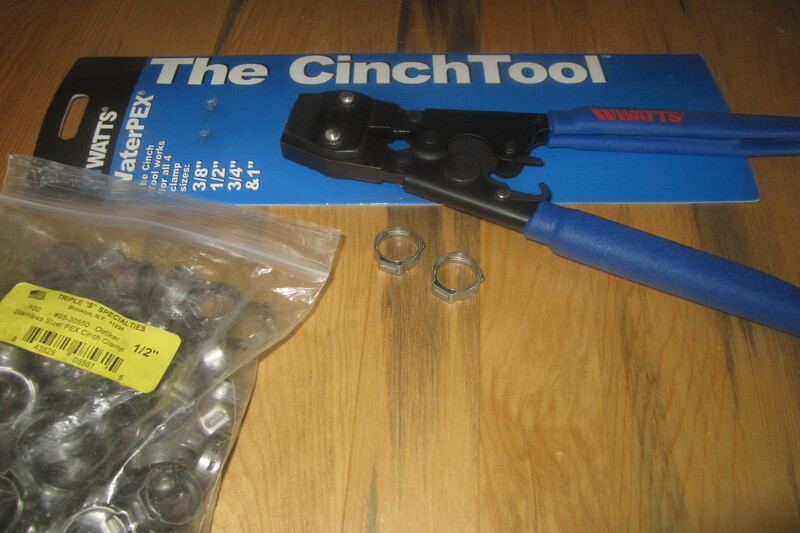 The cinch clamps require a spear type of connection that the pex slips over and then the clamp is cinched together with a special tool. This type of connection is a cinch that is for sure! I brought over one of the dangling electric lines to a new box and installed an outlet and cover. 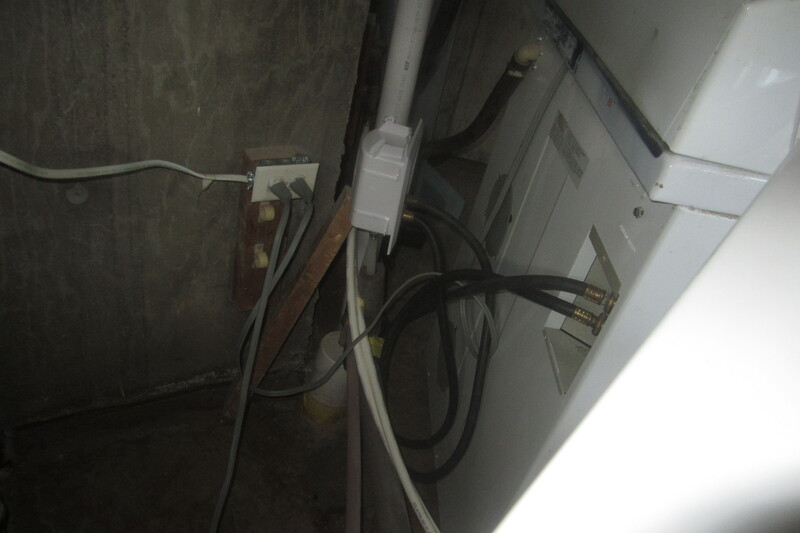 It was a 20 amp fused line that was originally in the utility room. The washer hookup is attached to the top of one of the water loop connections. There are two in the same area which helped turn this corner to cross the room as well as providing one supply for the bathroom and one for the utility room. 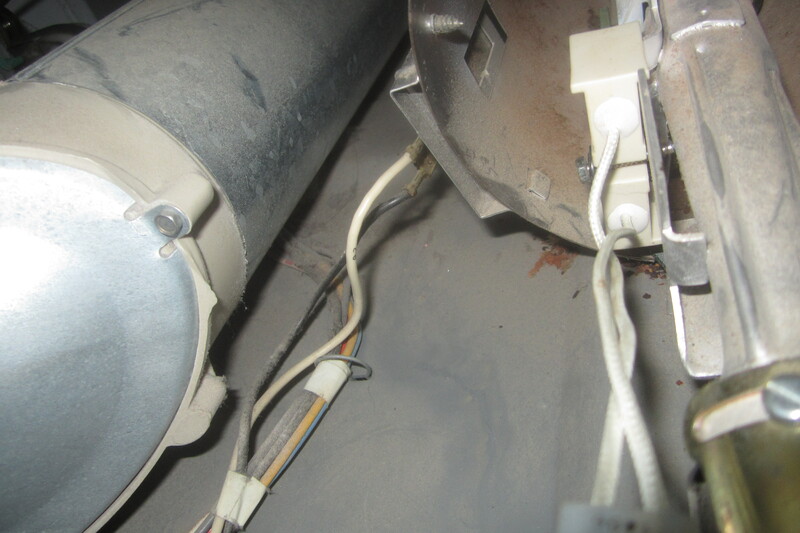 The drain kit was connected to a stand pipe that was vented with a roof air pipe to one further down the line, however, this vent is not necessary because there is a wet connection just down the pipe so it will be fine to disconnect it end with the stand pipe and reroute the vent pipes. 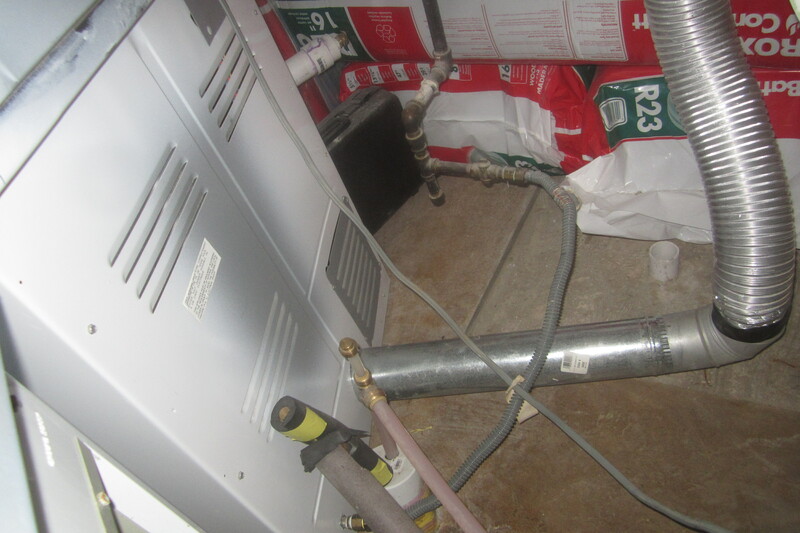 The temporary sink is actually hooked up to the original washer and dryer lines that are not part of the loop but extend from the boiler itself–this line provides hot water that is not tempered and is so close to the boiler that the water is hot immediately. 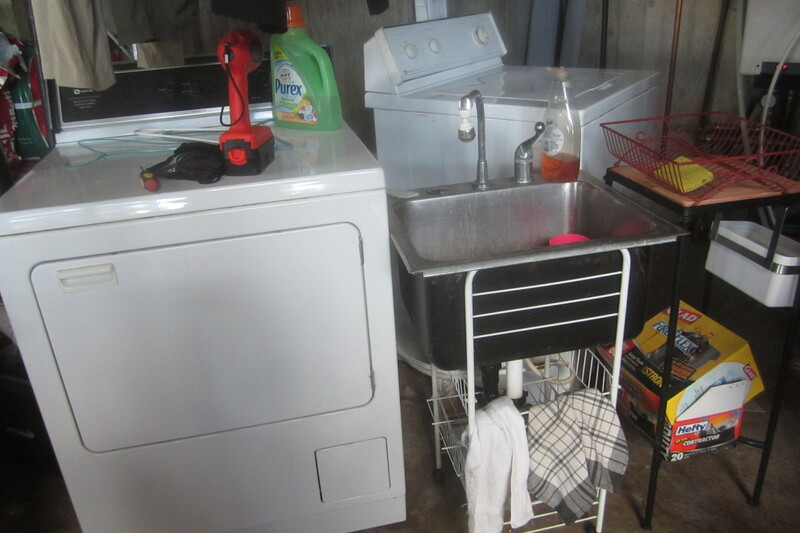 However the washer is the first connection on the loop and it also has hot water flowing immediately–it is the far connections that have to wait for the hot water. The plumbing inspector recommended we make more use of air inlets in addition to venting to the outside. This is the kitchen drain setup that was supposed to be the vent for the floor drain and will be enclosed in the utility room wall. Not all the pipes are glued so they can be reconfigured when the sink is moved. The washer connections all worked the first time. I cleaned up the washer, plugged it in, ran a load of just hot water and it was ready to go. The dryer hookup was a bit more tricky as I had to scrounge the original flue pipe, reconfigure it, and drill out some old rivets. The existing gas line was close and long enough so it was easy to use yellow gas tape, check for leaks, plug it in and start up the dryer. Although the dryer tumbled when it was turned on, it didn’t heat up. Quick research on the internet turned up the most likely culprit, the igniter. 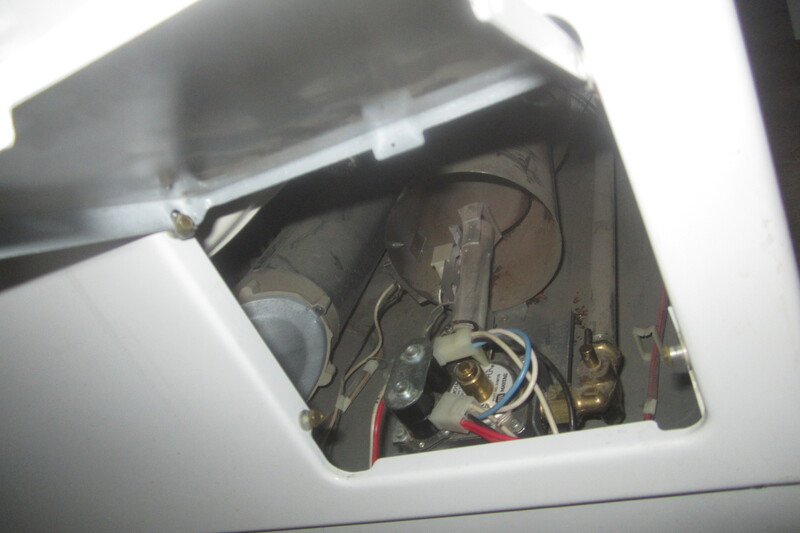 Luckily this model had a small access door to the gas heat mechanism so the dryer did not have to be taken apart to fix it. I ordered an igniter from Amazon because of their quick shipping. I couldn’t find a Maytag igniter with Prime so after more research I ordered a Whirlpool part as these are very common and do work across brands. Gas dryers are very simple and it was fun to learn about how they work. The igniter glows red and when it is hot enough a flame sensor opens the gas valve and the gas ignites. Then the igniter turns off and the gas burns until a temperature sensor is activated when the dryer is hot enough shutting off the gas. When the temperature drops, the sensor tells the igniter to glow again and the process is repeated. The igniter is very fragile so it is often the first part to break, especially if the dryer has been moved a couple of times like ours has. It would also be easy to replace the flame sensor and the coils in the gas valve, two other parts that could have been bad. So now we are set to both wash and dry our clothes in our unfinished home. What luxury. 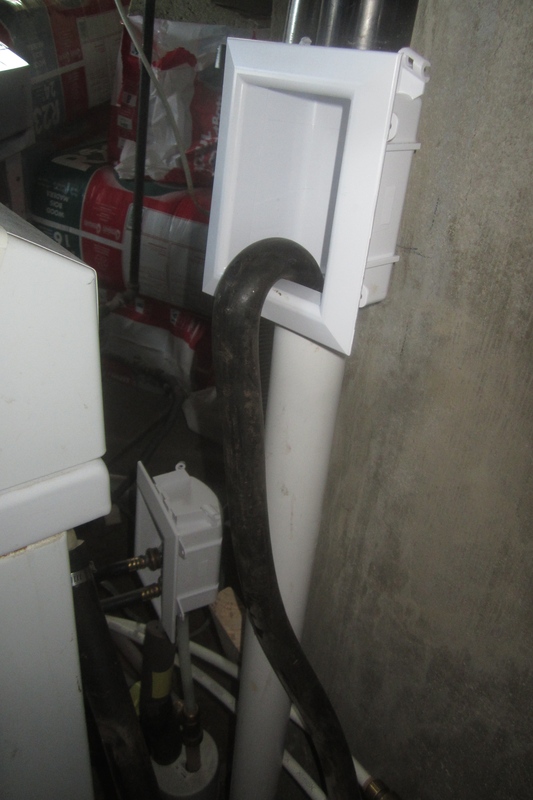 This entry was posted in Appliances, Maintenance and Repair, Plumbing. Bookmark the permalink.